Late tomato blight was discovered in Buncombe County last week. This is a reprint of a post written by Debbie Green, originally published two years ago. Tomatoes should be reaching their prime, and if you have lush green plants with ripening fruit, enjoy your harvest. 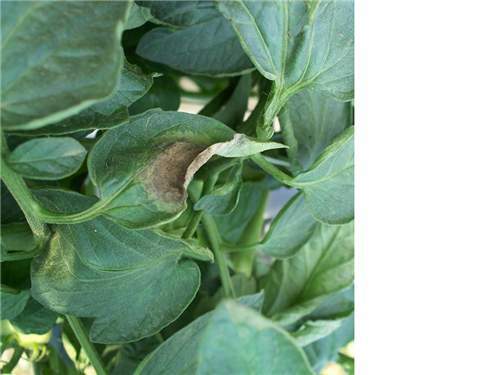 If your plants aren’t looking so good however, they may have one of the many tomato diseases that sometimes thwart even the most experienced vegetable gardeners. 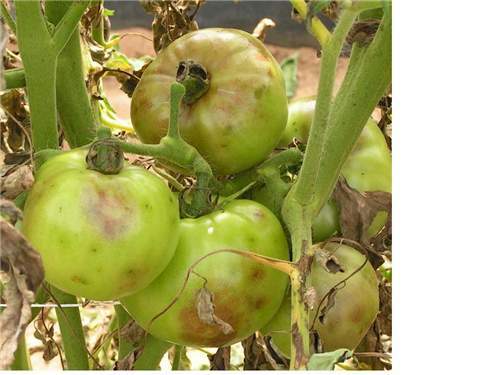 One of the most serious of these is late tomato blight, which typically affects plants later in the growing season, but has been confirmed on plants in West Asheville as of early July this year. This disease can spread spores as far as 20 miles, so identifying the disease and destroying the affected plants may spare others’ tomatoes from developing the symptoms. 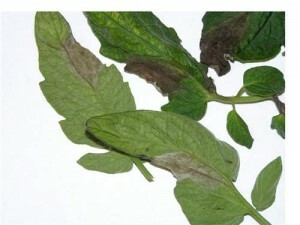 The first symptoms of late blight on tomato leaves are irregularly shaped, water-soaked lesions. Rain and high humidity are both favorable conditions for the spread of late blight. Once your plants are infected they can’t be cured; fungicides containing copper or chlorothalonil are currently the only treatments proven effective to prevent late blight. If you spray your plants, follow label directions. Take care to cover all leaf surfaces; use eye protection and other precautions to prevent contact with the spray. The good news is there are less devastating diseases that are not late blight, so getting a positive diagnosis is important. The first signs are irregular dark spots that look water-soaked on the newer leaves at the top of the plant, often with a lighter-colored “halo” around them. As the spots enlarge, the leaves shrivel and die. You may also see white cottony growth on the underside of the leaves. Both ripening and green fruits are also affected, with greasy looking spots that turn brown and leathery. During humid conditions, white cottony growth of P. infestans may be visible on the underside of affected leaves. There are many images available online to help you determine if you have late blight; one of the most comprehensive series of photos is this one prepared by Dr. Meg McGrath of the Long Island Horticultural Research and Extension Center: http://www.longislandhort.cornell.edu/vegpath/photos/lateblight_tomato.htm#images. If you are unsure about the diagnosis, you can bring photos and samples of your plants to the Master Gardener Clinic at the Buncombe County Extension Office. If you do have late blight, bag up your plant as soon as you can, but do it on a sunny day to reduce further spread of the disease. You can salvage already ripened fruit or green tomatoes that don’t show symptoms; these are safe to eat. Take care to look for affected plants other than tomatoes, especially potatoes and petunias. Weeds in the nightshade family may also show symptoms and should be removed and bagged. Infected fruit are typically firm with spots that eventually become leathery and chocolate brown in color. If you lose your plants, there is always next year. There is ongoing research on less susceptible varieties and some evidence that ‘Defiant,’ ‘Mountain Merit,’ ‘Mountain Magic,’ and ‘Plum Regal’ tomato varieties are resistant to late blight. Consider planting these varieties next season if you want to increase your chances of a blight-free crop.